The C-Suite approved the big bucks to deploy a new HR Cloud solution. You promised them efficiency, transparency, and, that’s right, analytics. 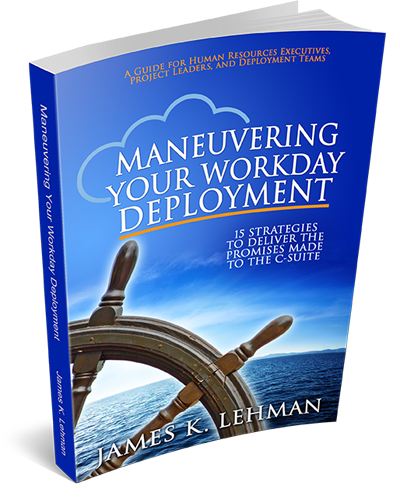 From award-winning author James K. Lehman’s new book, “Maneuvering Your Workday Deployment – 15 Strategies to Deliver the Promises Made to the C-Suite.” – James shares key strategies and lessons learned from multiple HR cloud deployments. James takes us on a journey of uncharted waters. Even though the IT Team may have led many projects in the past, it is a new adventure for the cloud project team, made up primarily of HR functional leads. This is not just a system replacement, but a full HR Transformation effort. Just like steering a ship, the maneuvers you make can have a huge impact on the organization or can beach you on a reef. James offers a guide for HR Executives, Project Sponsors, Project Leaders, and Team Members. It also is a great guide for HR Transformation Consultants and Deployment Partners. The Cloud Vendors and Partners all have their deployment methodologies for getting the new system in. But, these methodologies often leave out the all-important steps you need to take within your organization. James fills in the gaps for you, the customer, to Deliver the Promises Made to the C-Suite.